Susan Dorothea White is an internationally exhibiting artist based in Sydney. She is a multidisciplinary artist and author, and produces paintings, sculpture, prints and drawings. White’s career spans more than five decades; her solo shows include New York, Amsterdam, Cologne, Munich, Sydney, Adelaide, etc. 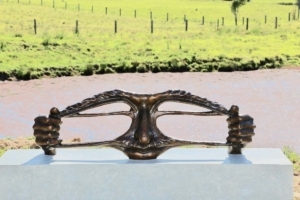 She has represented Australia in numerous international biennales/exhibitions; her sculptures have been exhibited in USA, Japan, Germany, France, Switzerland, Italy, and The Netherlands. Significant group exhibitions include New York, 1994, Kyoto Museum 1994, 1995, 1996; Florence Biennale 2001; National Building Museum, Washington DC 1999-2004; Sapere Aude – Circuito Off, Venice Biennale (fringe exhibition), June 2013; Harbour Sculpture, Sydney 2017 (awarded First Prize Inside); Sculpture @ Bayside, Bayside Arts Festival, Sydney 2018. Born in Adelaide in 1941, White grew up in Broken Hill. She studied full-time for 3 years, commencing at the South Australian School of Art in 1959, transferring in mid-1960 to the Julian Ashton Art School, Sydney. She held her first solo exhibition at age 20, followed by many exhibitions in Australia, and internationally since 1980. White is represented in the National Gallery of Australia, Hechinger Collection (Washington), Buhl Collection (New York), Majdanek Museum (Lublin, Poland), and Australian regional galleries, and in private collections worldwide. Commissions include a bronze sculpture for the Buhl Foundation (New York) and the book Draw Like Da Vinci (London, Cassell Illustrated – Masterclass Series, 2006), published in English, French, Danish and Hungarian, illustrated with over 100 of her drawings.